The past few months I've been playing SWTOR as my main game. 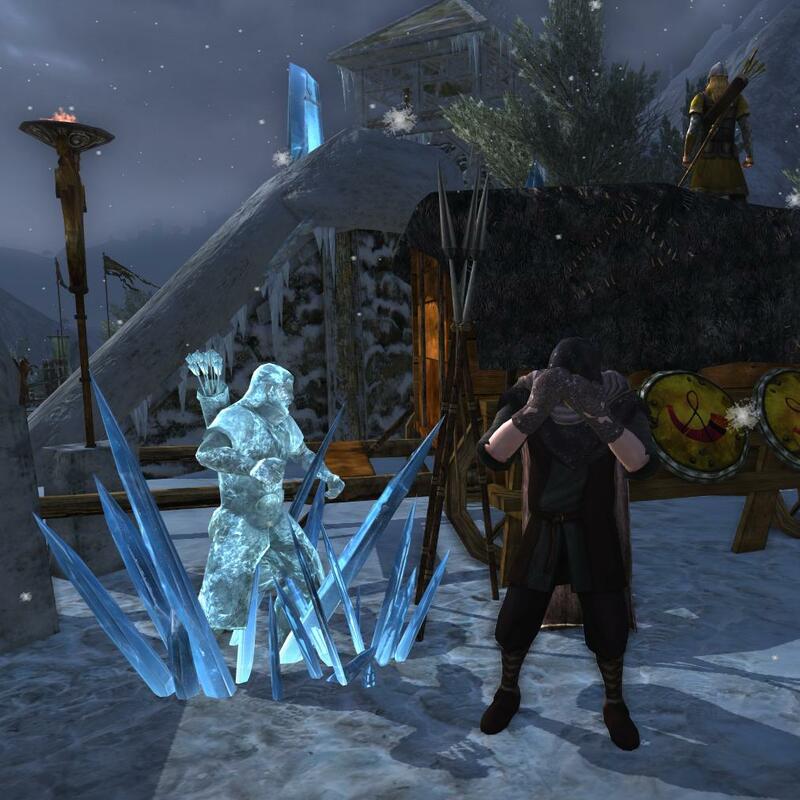 The only thing in LotRO that interested me was raiding, which didn't happen too often because of lack of signups. The Erebor raid hasn't been received with as much enthusiasm as we all had hoped, but that's another story. The point is that I had only been playing my lore-master, not my other characters, and the only thing I did with her was raiding occasionally. And as a result, the world of Middle-earth has slowly become strange to me. I think this has happened to everyone who has ceased to play a game very actively, after being absorbed by that world for a long time. When I logged in, everything felt familiar, yet strange. My first impression was that of annoyance, having to spend the points on all my legendary items and warsteed, plus having confusing alerts all over my screen. On the positive side, I finally managed to get Tiger to log into LotRO with me. He took his champion Fingolwë to explore the lands of Wildermore, the new area that was released earlier this week. Once you have seen SWTOR questing, you might say it's hard to get into questing in any older games. In SWTOR the quests are all fully voiced and appear in cutscenes, much like in any modern single-player game (like in Mass Effect or Assassins Creed, to name a few well-known games). This makes gameplay very engaging. In LotRO, quest givers still present you with the old-fashioned box of written text above their heads. Still, I liked Wildermore. One might need to take a bit more time to get into LotRO, the movement and combat feels slow, but once you've slowed down yourself and take the time to look at your surroundings, it's worth it. I experienced a strong sense of nostalgia riding through Middle-earth again. Its amazing landscape designers did their jobs well once more. The air looks thick with cold, giving a very realistic feeling. Of course Tiger started crying when we had to swim to a deserted island at the other side of the lake, but I just had to smile at the memory of the lake in Evendim ("Everswim") which took ten full minutes to swim over. It took Turbine three years to invent boats to take you over with just a loading screen. Oh, nostalgia. The lake in Wildermore wasn't actually that bad, and luckily it didn't freeze us to death (as in Forochel) either. We did experience an "is this safe?" moment before jumping in. I got a strong Skyrim-feeling when I approached the meadhall of Wildermore's major town. The designers must have looked at that game for inspiration, I cannot imagine else. If there's anything about Wildermore that I don't like, it's the design of the large icicles and the monster that's roaming the area. The villain looks cartoony, as if he walked out of World of Warcraft, and the icicles have a strange pointy shape. I guess they're intended to not look as if they belong there, and they succeed in that, but the style does break my immersion into Middle-earth a bit. The absurdness of the picture below makes me giggle a bit and feel bad about it at the same time. I guess it's not so much fun if your guard buddy is instantly frozen right next to you, but it's a strange sight. Story-wise the mini expansion follows the trend of a more serious LotRO, with the damage of Saruman shown all around you. No more delivering mail for curious hobbits, but helping out in the real fights, there where it matters. Many heroes fall in front of our eyes, but we need to continue and give hope to these people. Though this sounds very grave, the conversations and questlines have a cute flavour to them, especially compared to the realism of SWTOR. There is a certain scent of romanticism in this game, in the way the world is perceived. Perhaps this is why so many enjoy it. "Winter in Wildermore", it could just have been Turbine's title of this update. Nice pictures. Welcome back. :) I had the same feeling of "Forochel-freeze-fear" when wading into the icey waters in Wildemore. Does that other game only have quest information by voice? That would make it non-playable by those who couldn't hear it. Thanks for the welcome back. And no, in SWTOR you get cutscenes, like a little movie during parts of the quests. It got subtitles so it's just as clear as a normal story (although you can disable those, if you want).